Having not sighted more than the odd Dusky Robin for some weeks, a recent walk in the Peter Murrell reserve at Kingston, made for a memorable morning. I have been on the lookout for a chance to get some shots of Dusky Robins (amongst other species) and I knew from previous visits that there was one area in this reserve that I could be almost certain to find a pair or more. I entered the reserve at the northern, "Fork in the Road" end and walked down the western side, mainly to fully enjoy the early morning sun. I managed to photograph some of the individuals in a flock of Superb Fairy Wrens, fossicking among dead blackberries. I noted several Forty- spotted Pardalotes silently feeding with rather noisy Spotted Pardalotes, and heard a Striated Pardalote calling repeatedly, which suggests that they will breed shortly. I followed the horse riding trail until I reached the 'Middle Fire Trail', and it was here, as I expected, that I saw my first Dusky Robin of the day. I took up position at the gate and watched and waited for my opportunity to get a few shots. I had chosen my spot well, because in no time I had several birds around me, mostly feeding on the ground, but returning to the several posts in the vicinity as vantage points to find further prey. The party was however quickly spoilt by the Yellow-throated Honeyeater pictured. Evidently the 'Duskies' had flown into the honeyeaters territory, and it hotly pursued them. They in turn ended up too near the mates of other Duskies', and it was on for young and old. Decorum was finally restored and as they got used to my presence, they came ever closer, enabling me to get several shots. I've since pondered on why that particular spot holds so many Dusky Robins, obviously for them it has special properties, but they're not readily apparent. It has good cover, posts and similar as vantage points, open paddocks where there's apparently a plentiful food supply, but so has, at least to my eyes, many other spots. When I contributed to the nest record scheme, many years ago now, I did find that Dusky Robins do nest quite close together in some favoured sites. Perhaps this spot is worthy of more detailed study. John Tongue writes: My wife and I are self-confessed "listers--we keep all sorts of lists of the birds we see....on holidays, on a trip, from the yard, across the state, and so on. 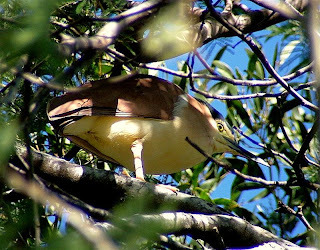 One bird that had eluded us for our Tasmanian list was the Nankeen Night Heron. Despite searching for it on King Island (a supposed stronghold) during our 2005 holiday, and calling many times at Bell's Parade at Latrobe (where they are also supposed to reside), we hadn't been able to chance upon one anywhere. We'd seen lots when living on the Mainland, but never one in Tassie. That was until we met Peter and Hazel Britton. They are also of Ulverstone (where we have recently moved to), but hadn't caught up with them until the recent North West wader count. We got talking about various 'bogey birds' (those that seem to elude us), and for us, one of these was the Nankeen Night Heron. Hazel said she'd photographed them, quite easily, just a few days before, at Bell's Parade. It seems we'd been searching the wrong trees! With a little bit of first hand knowledge, and a beautiful Summer's afternoon, we set off back to Bell's Parade, and within a few minutes searching, had found two! We are not sure how many regularly roost here, but these two were a very welcome sight indeed. Neither was in a particularly easy spot for photography, hence the fairly mediocre accompanying shot. 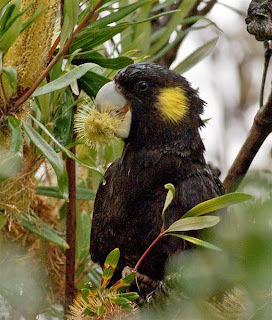 But thanks to Peter and Hazel, this is now one 'bogey bird' we can finally "tick" on our Tassie list. Suffering a recurring chest complaint that has laid me low, I've had to confine most of my birding and photography, to what I can see from and near the car. In reality, the car is a great hide ("blind" to some readers), and often birds will allow a close approach not possible on foot. It also means that you often spend time observing the common species in more detail, as here, the Masked Plover. For much of the year the 'spurs' are seldom seen (top image), and it wasn't until, many years ago, I found a dead one, that I realised just how big (and sharp) these spurs are. At the moment, with their breeding season imminent, if not already started, there is much aggression shown among 'spurwings'. I noticed the 2 birds in the l ower image, feeding quietly among the weed covered local rocks. They were approached by a group of their own species, which attempted to land close by. Bad choice! The 'resident' pair immediately took flight and engaged the flock in spectacular aerial combat, driving the interlopers off, before returning to feed. The intruders obviously enjoyed the fight, because they shortly reappeared. This time the residents resorted to posturing, including displaying their weaponry, combined with raucous calling. After a few flybys, the intruders had second thoughts, and flew off. Obviously in the mating game, showing the weaponry is everything!! I must confess that I still call these birds "Spurwings", and they're still generally known by that name locally. However the similarly named species of Africa takes preference in the naming stakes, so I'll just have to keep reminding myself that they're now Masked Plover. Saturday morning dawned wet and heavily overcast, so I had, what for me is a very rare event, a lie in. 8.30 found me dressing and pondering over the day ahead, when I heard a Yellow-tailed Black Cockatoo call. Knowing that a local Starling gives a very good rendition of the Yellowtail's call, I continued to dress. Almost immediately I heard a shout "there are cockatoos in the garden". What followed would have made an interesting video, as I chased around for the camera, then realising I was still only half dressed and no condition to be charging round the garden. Reaching the back door sockless, but past caring, pulling on my still drying gumboots (from my Lauderdale excursion), I stepped out. Back inside! It was pelting down with rain! Try again with bush hat and coat! I was at least relieved to see 2 of what proved to be a flock of 7 birds, still feeding on the nearest banksia. Rather belatedly, I found the conditions for photography to be close to useless, but I'm beginning to conclude that I'm a serial bird photographer, so I pressed on. I was actually able to get quite close to them, as you can see in the accompanying shots, but that couldn't make up for the poor conditions. Watching them feed, I found that they were clipping the flower heads off and 'licking' the nectar, sometimes flying briefly, still holding a flower. 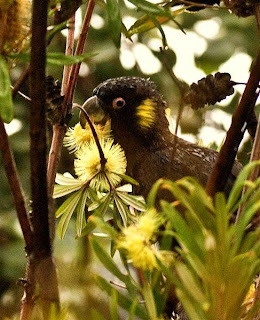 Several times they flew between our two Banksia integrifolia, often only a few feet above my head, and it was this that attracted a neighbour. He rushed outside (still in shirt sleeves! ), shouting to his wife (loud enough for most of the neighbourhood to hear) , marvelling at their size and grace. I've never heard a non birding person get quite so excited! I suspect that it was all this commotion that finally caused the birds to move on. I hope that before the Winter's over, they'll pay another visit, perhaps in better photographic conditions. If you're wondering why I referred to their visit as a 'raid', you should see the pile of banksia flowers under the trees. As I towelled myself and my gear down, back inside, I wasn't sure what I had derived more pleasure from. The presence of the Yellowtails in the garden, or the genuine excitement that my neighbours had got from seeing them so close for the very first time! Earlier this week, I set off for Pipeclay Lagoon, hoping that on the early morning high tide I might get a sighting, or better still, some photographs of the waders on the high tide roost. In the event the tide failed to reach any great height, and I retraced my steps to the Lauderdale Spit. This proved to be a good option as the waders reported to be at Pipeclay, had moved to this venue, (got to get lucky sometimes). As I dodged the traffic to cross the road to the spit, I could already see waders. These were almost certainly the same birds I had mentioned in the previous blog, Double-banded and Red-capped Plover, so I decided to concentrate on getting photos of the Double-banded. As I closed on the loose flock feeding on the edge of the incoming tide, I realised that a little further along the spit were several Bar -tailed Godwit. I must have got a little over excited at this point, as I managed to step into the only deep pool on the saltmarsh! Now sporting water filled gum boots, but eyes still firmly fixed on the 'sleeping' Godwit, I used a storm cast dead tree trunk as scant cover to get closer. They didn't move, although they were obviously well aware of my presence. I sat down on the tree trunk and in the next twenty minutes, took the accompanying shots. There proved to be 5 Bartails and a lone Whimbrel. The Whimbrel was a bit nervous and at one stage flew off several metres, landed, looked round, realised that the Bartails hadn't moved, and ran back to join them. I like to think it was embarrassed! A brief e-mail from Priscilla Park alerting me to the presence of a Grey-tailed Tattler 'awakened' me from my recent lethargy, which has curtailed my blogging. In my defence, I have had a computer melt down, photographic equipment failure and more than a touch of mid Winter blues! But back to the Tattler. Priscilla mentioned that she had seen it on the northern side of Lauderdale Spit at high tide, but described it as "v. nervous". So as the sun was rising the following day, I could be found wandering through the salt marsh that backs the spit. I could already see that there were a number of small waders feeding on the edge of the rising tide, their white parts standing out in the early sun. I stopped and scanned them with my binoculars. There were probably around 60 or so birds, made up of Red-necked Stint, Double-banded and Red-capped Plovers, but no other waders. I scanned around the shoreline. Two flocks of Pied Oystercatcher totaling around 80 birds, many hundreds of Silver Gulls and odd Kelp and Pacific Gulls, but that was about it. I could at least take the opportunity to get a few shots of the Double-banded Plover, now in a wide range of plumages ranging from almost no chest bands to almost full breeding plumage, as seen in the lower image. I closed on the spit, taking care not to disturb the roosting Oystercatcher flock. At this point I noticed a yellow legged wader running out of the marsh and onto the sand--the Grey-tailed Tattler! It's the first I've seen for some few years, so I was more than a little pleased. There was a time when small groups of up to 6 birds, could regularly be seen at Sorell and Orielton Lagoon area, and occasionally at South Arm, but the numbers recorded have declined in recent years. So this Tattler is an uncommon Summer visitor to Tasmania, and rarely recorded in Winter, and I don't know of another Winter record from southern Tasmania. I spent much of the next half hour trying to get close enough for a reasonable shot. In the past, I've nearly always found Tattler easily approached, although this was the first time I've tried photographing them. This individual had effectively "embedded" itself in among the plovers, so if they became edgy, so did the Tattler. I never managed to get as close as I would have liked, but the benefits of digital imaging came to my aid, as you can see in the upper image. Later, I did spend a good while comparing it with images of Wandering Tattler, an as yet unrecorded species in Tasmania I believe. I now know why many field guides say that the 2 species are not easily distinguished in Winter plumage! I live in hope.